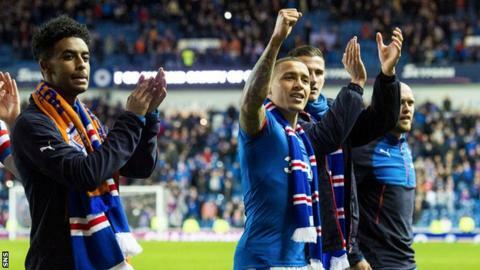 Rangers will play top-flight football next season, having clinched the Scottish Championship title with their 1-0 win over Dumbarton on Tuesday. Mark Warburton's side secured promotion with four games to spare, having lost only three league matches all season. It marks a key step on a journey that began almost four years ago with a 2-2 draw at Peterhead in the Third Division. The road to the Premiership has been fraught with difficulty at times, off-field as much as on, but this season under Warburton has been a much smoother ride. With a Scottish Cup semi-final against Celtic around the corner, it appears brighter times lie ahead for the Ibrox club. Warburton's influence since joining Rangers in June last year cannot be overstated. He has revolutionised the team's style of play, introducing an attacking brand of football supporters have relished. The team is unrecognisable when compared with the one that finished the previous season so disappointingly, losing to Motherwell in the play-off final. Of the side that started the 3-0 second-leg defeat at Fir Park, only Lee Wallace and Kenny Miller have played any significant role under Warburton, with the majority having departed Ibrox altogether. In have come a carefully selected crop of players, none of whom attracted great fanfare, who have been moulded into a slick-passing, mobile, clinical unit by Warburton and his assistant Davie Weir. What Warburton has had in his favour, unlike predecessors Stuart McCall, Kenny McDowell and principally Ally McCoist, is a measure of stability behind the scenes. Where McCoist had to wrestle with the turbulence of an ever-changing boardroom, financial uncertainty and fan boycotts, the coup led by Dave King has meant the current manager has seldom had to deal with public controversies of the kind regularly visited upon previous coaching staff. Money was provided to improve the squad, with only the failure to land Scott Allan and Toumani Diagouraga hinting at a discrepancy between Warburton's and the board's vision for the future. The mantra has been about ensuring value for money, though King has expressed a willingness to spend more than £20m of his own money in order to make Rangers competitive at the top of Scottish football. Figures released in March indicated he and fellow investors had put in £9.25m - in the shape of interest-free loans - by the end of last year and committed to plugging a funding gap until the end of this season. The question is, how much backing will the board give the manager in the next transfer window and, indeed, what is required if Rangers are to compete at the top end of the Premiership next season? Until such time as a new share issue takes place - and that won't happen until criminal proceedings against Craig Whyte, Charles Green and others conclude - the transfer budget will be determined by season-ticket sales and the continued willingness of King and his fellow investors to front up. If Hearts' first season back in the Premiership is anything to go by, a well-managed Championship-winning side doesn't require wholesale surgery to aspire to a top-three finish. Nonetheless, supporters will expect at least two or three more acquisitions capable of immediately improving the first team. With Billy King, Dominic Ball and Gedion Zelalem returning to their parent clubs and players like Nicky Clark, Nicky Law, Dean Shiels and David Templeton out of contract, the squad will need beefing up. Warburton has shown an ability to identify talented players - James Tavernier and Martyn Waghorn arguably the most notable - for little outlay and Rangers are unlikely to stray far from that template, an acknowledgement that spending beyond their means is not a viable option. Josh Windass and Matt Crooks have already been signed on pre-contracts and head of recruitment Frank McParland will undoubtedly already have spoken to other targets in England. Expect the club's young talent to continue to be given the opportunity to flourish as well. It's hard to be overly critical of any particular area of a team that has been much too good for the competition over the course of the season, scoring 83 goals and conceding 27 in the league thus far. If any department has attracted criticism, it has been central defence, where the partnership of Danny Wilson and Rob Kiernan has tended to be the preferred option. That has to be tempered by the fact the team's attacking ethos has at times left the defence exposed, but a quick, commanding centre-back could still be a priority. The loss of Waghorn to injury hasn't been felt too keenly, but the absence of an obvious alternative would surely be more damaging at a higher level, so another out-and-out frontman is also likely to feature high on Warburton's wish-list. Ball has been used to good effect as a holding midfielder in games against strong opposition and, assuming Rangers persist with the tactic of allowing their full-backs to operate in the opposition half more than their own, that role will be an important one to fill on a more consistent basis next season. This transfer window and the season ahead promises to be an intriguing one, perhaps even an exciting one, for Rangers fans.